Matt and Scott put Rouleur on display at the 2018 R2AK Ruckus. Here is a Google album of Matt Johnson updating his V16R2AK pedal-boat in the lead up to the 2018 Race to Alaska (R2AK). Matt was able to lighten Rouleur by ~20 kg (60 pounds) by removing the wooden decks and amas and replacing them with a lighter material — divinycell foam sheets strengthened by fiberglass — and by fabricating new, lighter beams from a foam core and laminated cedar bottoms/tops. He also added a suite of features to make pedaling 18-hours per day more comfortable, including a sea-kayaking rudder, wave shedder, and a new cockpit cover — including a spray skirt and sun/rain bimini. While most of the 2015 Race to Alaska (R2AK) was rather breezy, the very beginning of stage 2 (from Victoria to Ketchikan) offers an opportunity to compare the speeds of the diverse boat types in the fleet. Not only is sailing not allowed in the inner harbor of Victoria, but there was virtually no wind during the first couple hours of the Race. As the ebb tide weakened and the bulk of the fleet made the big left turn from the Strait of Juan de Fuca into Haro Strait, a light southerly filled in and the sailboat race began (see plot of wind speed at Kelp Reefs below). Not until 2 p.m., a couple hours into the 2015 R2AK, did the southerly begin to flow up Haro Strait. This near-calm period affords an opportunity to compare the speeds of the many different types of human-powered propulsion that were utilized by the 2015 fleet. Boats with a wide range of designs and displacements used oars while others tried 1- or 2-bladed paddles. A hand full of technological innovators used pedal-powered propellers or adaptations of the Hobie Mirage drive. Six-minutes after the bell, the Soggy Beavers pass Team Sea Runners on route to set the Point Gonzales speed record: 9.26 kph. They passed Point Gonzales just one hour and 8 minutes into the 2015 Race to Alaska. The fastest boat (Team Soggy Beavers) was a long, narrow, lightly-loaded hull propelled by Canadians using the most tried-and-true technology on the Pacific Northwest coast: the canoe paddle. The next three fastest boats used pedal drives, assisted in some cases by a paddle: Hexagram 59 was relentless in their use of a supplementary SUP paddle (always on the port side! ); Sea Runners occasionally took vigorous strokes with a canoe paddle. Turn Point Design had a carbon fiber cat driven by the largest prop among the pedal-powered boats. One interesting pattern is that the 7 top speeds were obtained with less traditional methods (not rowing). After them, came the three fastest boats that were rowed: the Boatyard Boys (small boat, strong rowers; coincidentally almost matched by Team Mau with an athwartship pedal system), Elsie Piddock (the winners of the windy 2015 R2AK), and MOB Mentality. This pattern hints that there are still speed gains to be made by both rowers and technological innovators. This year Colin Angus and Mathieu Bonnier will bring a LOT of rowing experience to the race. And Matt Johnson will bring some serious pedal power. His interest in pedal-powered boats is partly fueled by an interest in breaking the World record for 24-hour distance in a human powered boat. This Google spreadsheet of human-powered boat speed records and measurements shows how high the bar has been set over the years — primarily by pedal boats and kayakers. The speeds maintained over 24-hours have been creeping up over the decades. Kayaks have gone from 8.04 kph in 1988 to 10.15 kph in 2013, while pedal-powered boats have increased dramatically from 3.76 kph in 2000 to 10.22 in 2008. Overall the 2015 R2AK boat speeds over those first 10.5 km bracket the speeds maintained over long distances by rowers and kayakers (3-5 kph; e.g. Colin and Julie rowing across the Atlantic averaged 3.9 kph). 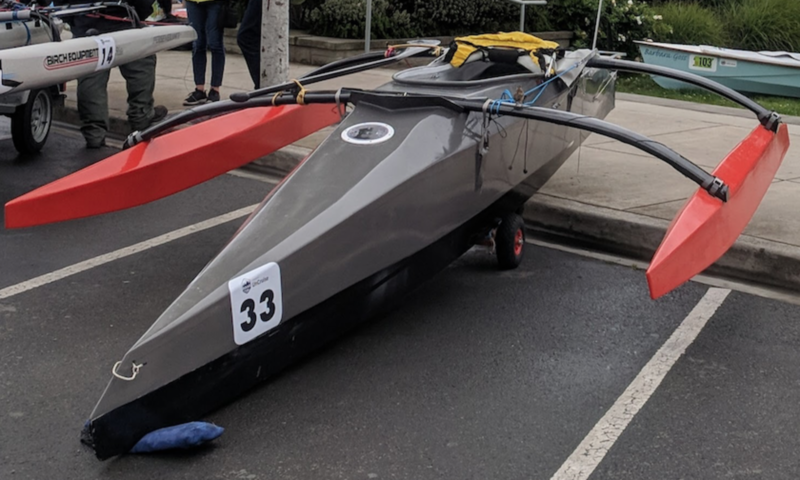 But the upper R2AK speeds aren’t far from the World record paces of pedal-boater Greg Kolodziejzyk (10.5 kph) or Bellingham-based kayaker Brandon Nelson (10.22 kph). The top sprinting speeds achieved historically indicate an upper edge of what current technology may soon deliver over a long course like the R2AK (ignoring factors that limit human endurance): 17.6 kph for Gordie Nash in a pedal boat; 20.55 kph (11 knots!) for Olympic kayak men’s K4 sprint. Who do you think will beat the “Point Gonzales record” (of 5 knots) this year? The slack will come about an hour later this year, but the max ebb is about a knot less than last year. May the best technology and most powerful racer win! The Race to Alaska (R2AK) is an un-supported challenge in which reliable communication and navigation is important, but energy supplies are often limited. Many of the smaller boats want to be light to make sailing or human propulsion faster, so taking tons of batteries isn’t an option. Solar charging systems can be limited by inclement weather. And getting wet is pretty much guaranteed on a small (<20′) boat. Here’s the system that Team Puffin used in the 2015 R2AK. This set-up was derived from systems that were used aboard the same Wharram Tiki 21 sailboat (“Milagra”) during summertime cruises over the last 5 years. Here’s a spreadsheet that compares the mass, cost, and other factors for the Tiki 21 system and the modified system for the V16 R2AK. How will you power your R2AK? Here’s the system undergoing transformation from Team Puffin (2015) to Team Take Me to the Volcano (2016). Here’s the final result. This may still be too heavy for Matt to use in the R2AK, but it is an incremental improvement in the cruising system I’ll use aboard the Hitia 17 or Tiki 21. The new and improved electronics box. Lowered total mass by about 2.0 kg overall. The big savings of 2.1 kg was from switching from Pb-acid to lithium iron phosphate battery. We take a little hit in capacity (going down from 12 to 9 Ahr), but presumably that can be supplemented by adding a USB lithium battery brick. Considered a Pelican Air, but the mass savings for the smallest that would fit the 10W panel was only 500 g.
I re-sealed the holes in the case with Tap Plastic’s recommended 2-part glue for polyethene (adding some glue mass, but simplifying the seal of a big historic hole in a way that reduced mass a bit). It’s not a simple connection of the 12V wires to the radio! I ran into two tricky bits in implementing the lithium battery upgrade. These are Deep-Cycle Batteries for extended continuous use, not to be confused with High-Rate Batteries which are for starter applications only and not for extended continuous use. I ended up choosing the BioEnno Power 12V, 9Ah Pb-acid equivalent LiFePO4 deep cycle battery. Though it is only ~1/2 the mass of the current Pb-acid battery in our system and still costs ~4x as much, I’m excited for the weight savings and to try this new technology. I was also motivated to go with them since they sell an AC charger ($22) and a 12V/10A solar controller ($40) that specify having a charging algorithm that is appropriate for LiFeSO4 batteries, though it’s not clear to me whether or not they use a 5-stage LiFePO4 charging algorithm that Battery Tender recommends. On Sunday (5/22/2016), Team Take Me to the Volcano launched the “V16 R2AK” at the Secret Beach in Ballard, Seattle. Around 6pm Matt, Mark Dix (Team The Windsurfer, Stage 1 R2AK, 2015), and Scott finished bolting iakos to amas, having leveled the main hull and amas before drilling the final bolt holes in the inboard end of the iakos. We loaded up the main hull on Mark’s car and the amas on Scott’s and headed (carefully, remembering Colin’s tragedy) down the curvy road to Puget Sound. At the beach Chris and Mik met us and helped unload onto the sandy beach. High tide was approaching, so once we re-connected the amas and main hull with some help from Sam (of Team Puffin, R2AK 2015), set up the seat and other gear, it was easy for Matt to pull the boat into the sea. With Matt aboard and a fair amount of gear, the step out from the lower to upper hull was 95-105 cm above sea level. We tried loading 50 pounds of weight behind the seat, but thought that pushed the rudder assembly a little too deep. When Matt was pushing hard the steering arms on the rudder were mostly submerged. With the 50 pounds removed, the rudder arms were clear of the water (except when waves passed over it). Overall, it looks like it will be helpful to get some more weight up forward — which of course will happen when the sailing rig gets stepped (just forward of the forward beam). With the initial trim set and some confidence that it wasn’t leaking, Matt brought the boat back to shore for a proper Christening. Lisa and Ciana had arrived with champagne and proceeded to help Matt name the boat “Rouleur.” The beautiful Douglas fir bows were glowing in the setting sunlight, glistening with the recent heavy rains, and foaming with celebratory champagne as we all hailed the arrival of another fine boat on our ocean planet! Matt then took Rouleur out for another longer spin. A few minutes after he had disappeared “upstream” toward the Ballard locks, it was an awesome sight to see him blaze bast a couple cruising kayaks. It seemed he was suddenly off towards Ketchikan at high speed! But he eased off on the power at the last-minute and circled back to us. Near the beach a set-screw gave in to the tremendous torques Matt was pushing through the right angle drive, so our sea trials of the pedal propulsion system had to cease. It was easy to return to the beach with gentle pedaling, and earlier it was clear that the back-up human power method of a SUP paddle was also effective. Matt takes a seat he’ll sit in a LOT. The view seaward from the hot seat. Map of the 2nd test run (w/50 pound weights). Speed vs distance plot for 2nd circuit. Cruising speed was 8-10 kph. The initial speed data suggest that in flat water and no wind, Matt should be able to keep this boat in the 5-10 kph range pretty easily. Remember for the ~1200 km Race to Alaska, 10 kph mean VMG will get you to Ketchikan in about 5 days; 5 kph will get you there in 10! Averaging 15 kph 24/7 will beat Elsie Piddock’s record handily; you’ll be there in 3.3 days! For comparison, when Greg set the world record for distance in a human-powered boat over 24 hours, he averaged 10.22 kph. Here’s a spreadsheet of long(-ish) distance speed means for human-powered boats. While sprinting kayaks can hit 17-20 kph, a huge question in the 2016 R2AK — especially if there are extended windless periods — is whether Matt’s cycling prowess and the Rouleur’s pedal-propulsion system can sustain ~10 kph over significant stretches of the BC coast. Longer 3rd run (50 pound weights removed). Speed vs distance for 3rd, longer circuit. Top speed was about 13 kph, average about 10 kph! My favorite part of the evening was seeing Rick Willoughby‘s design assembled and afloat. The curved iakos seemed to connect in a near-circular arc. Rouleur seemed perched on the water’s surface, wings outstretched — both embracing the sea and poised ready to streak across it. One of the unique features of my new Race to Alaska trimaran are the canting dagger boards. They were designed by Rick Willoughby. Not only will the boards provide lift, but they will help counteract the heeling forces from the sail. I have very low volume stabilizer floats, so this lift will help keep me sailing level in a moderate breeze. The daggerboards can cant from 60 degrees off horizontal to about 10 degrees, where the tip of the board is clear of the water. The adjustment is made by moving the inboard end of the brace up and down the guide rod. Originally this control was going to be with control lines, but now I believe I will reach forward and do it by hand. It pays to have long arms. When sailing you lift the windward board and lower the leeward board each tack. When reaching both boards could be lowered to provide lift. The boards will also have a friction release of the board on the hinge plate so it is not fatally damaged in a collision. While these foils are not designed to fly the main hull, in the right conditions there will be some lift, and increased speed. Tonight I tackled the installation of the pedal mast and gearbox. Just another challenging job that I couldn’t afford to mess up. First I had to cut a big hole in the boat where the Mitrpak right angle gearbox will go. The shaft in the photo runs between a pillow block inside the pedal mast, and out to a coupling to the gearbox. The lower 14 tooth cog will attach to it. The prop shaft will actually run along the side of the boat. The hole is cut in the cockpit sole which hangs over the main hull about the width of the gearbox. Here everything is epoxied into place. The Pedal mast aluminum plates are bedded in epoxy, and sitting on a little square of fiberglass. Tomorrow I will fiberglass over the top of the attachment plates for the pedal mast. Below is a drawing of the latest design by Rick Willoughby. — a custom trimaran or stabilized monohull focused on enabling Matt Johnson to compete in the 2016 Race to Alaska (R2AK). Rick is an Australian engineer who designed the V series of pedal boats, on of which was used to set a World Record for 24-hour distance attained in a human-powered boat. Rick has pioneered the flex shaft propulsion system and dipping rudders, and in this R2AK-specific sailing design has also included a centerboard and canting foils. Over the winter of 2015-2016, I stopped by Matt’s house in Ballard a few times to help him build the hulls for his V16 R2AK. It was a pleasure to work in his recently re-organized shop, in part because I always get good ideas about how to improve the work space in my garage and often get to try using nifty tools — some of which I’ve never seen before! After checking out the table and chop saw work bench that Matt built, we epoxy coated some long lengths of door skin and then started laying out the bulkhead positions for the amas. I love that Rick’s plans are all-metric! We used hot glue to tack the foam bulkheads in place. It seemed to work pretty well, though you had to work fast and together to insert the bulkheads before the glue cooled too much. After the holidays we dry-fitted the base of the main hull. It was tricky to get the longer door skin panels to hold a smooth curve, especially between the bulkheads and near the re-curved part of the bow. After consulting with Rick, Matt decided to add a few stringers, so we worked together to rip them on his table saw. I also did some sanding of some a previous epoxy coat that had beaded up in an interesting pattern of stippled patches. It was nice to have the shop vac set up to filter out the dust. Now the main hull is taking form enough that one can imagine pedaling and sailing within it! We weighed it and Matt portage-posed with it before settling into the main job at hand: gluing decks on the amas.